Ireland produced a composed performance to come from a goal down to beat Wales 3-1, guaranteeing they will advance not just to Sunday’s final but also to Round 3 of the World League where the World Cup 2018 tickets will be decided. It was fine performance from the second quarter on, bouncing back after a low-key first 15 minutes in which Wales had the upper hand. They were rewarded with the first corner – courtesy of Owain Dolan-Gray’s right wing run – which Gareth Furlong duly dragged home for his fifth goal of the tournament. That awoke Ireland and, with Sean Murray driving things, showed much more spark in the immediate aftermath. Jamie Wright was felled out by the left sideline in unceremonious fashion to give Ireland their first corner and Shane O’Donoghue nailed his drag-flick for 1-1 in the 18th minute. The third quarter saw Jeremy Duncan go close after some gorgeous stick-skills and a reverse-stick shot. Chances were at a premium as Ireland kept Wales at arm’s length bar one penalty corner that Jonny Bell – who made a glut of strong tackles – Conor Harte and Jonny McKee all had hands in charging down. From there, Wales enjoyed plenty of ball deep in the Irish half but created only half-chances with Rupert Shipperley ballooning a shot over the bar while Luke Hawker touched over a sharp chance. It meant Ireland prevailed 3-1 with something to spare, securing their primary target from the competition. Speaking afterwards, coach Craig Fulton said was delighted with the performance and the ticket to the next stage of the World Cup qualification process. He paid tribute to Jonny Bell’s leadership performance at the heart of defence, a key factor in bringing together a side packed with new players on this stage. “It’s characteristic of a captain’s performance. He played well with all the defenders. We had to bring our best there to set our platform for attack. “We have had about 15 games together as a squad. Ranking goes out the window at a tournament like this – you can’t tell me Wales are 34th in the world! – and you have to do it on the day. “We are trying to play a pattern that we have been doing for 18 to 24 months, working off a nice defensive base and then look to counter and go forward. Even though we are putting new faces in, they know what is required. Goalkeeper David Harte added that the side is evolving quickly with so many new faces with eight players making their ranking tournament debuts and putting in high quality performances. “I’d use the word exciting to describe where we are. You see the young talent combine with the older heads – including me, even though I am only 28. The lads may have only five to 10 caps but they are showing a lot more than that. 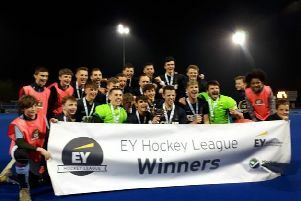 “Indeed, there’s guys like Jonny McKee and Sean Murray who even I would not have been too aware of but they are doing great things in the EY Hockey League and it’s fantastic to see them at this level.